As we near the beginning of Holy Week, final plans are coming together with Foundation Church in Everett, and Cross and Crown Church in the U-District, for our Good Friday With Friends events. This week we're celebrating these gospel friendships that God has given us with these ministry partners, and we're asking for you to join us in prayer for what God will do in and through our churches, for his glory, as we worship and minister together in his name. By inviting our church body to celebrate Good Friday with theirs, we all have the opportunity to truly exemplify the biblical value of kingdom mindedness. So, if you are in the north end, don't forget to join us on Friday, March 30 for Good Friday service at Foundation Church in Everett, at 6:30pm. Pastor Aaron will be leading the worship service, and Kids Ministry will be available. And if you are in the south end, please join us for one of two Good Friday services at Cross and Crown Church (6:00pm or 7:30pm). Our own Pete Wilson will be leading the worship, and Kids Ministry will be available at both services for the little ones (Nursery–4 years). THIS SUNDAY’S SERMON | JOHN 7:25–36 | "WHERE I AM, YOU CANNOT COME"
Jesus is often presented as a moral hero, a great example for people (both Christian and non-believers) to follow. While Jesus certainly is a morally exemplary person, John 7:25–36 shows us that Jesus is not merely a good example to follow, but that there is something else about his life and work that we cannot emulate. “Where I am, you cannot come.” Join us as we look at Jesus the Redeemer and Savior, and how grasping these truths enables us to be able to follow his example. This is the final Sunday to join Sound City Kids Ministry in partnering with the HEED Uganda School for this Marker Drive. If you would like to partner with us and donate markers to the children served by the HEED Uganda organization, please bring your donations to Kids Ministry by this Sunday. Thank you in advance for partnering with us in meeting this simple need for kids who, in many case, have never had the opportunity to use markers like this ever before. This year for Good Friday we're doing something a little different. Sound City will be celebrating Good Friday with a couple local church partners that we're honored to call our friends. For those on the north end, join us for Good Friday at Foundation Church in Everett, for a 6:30pm service. Kids Ministry will be available during the service, and Pastor Aaron will be leading worship. Directions to Foundation Church can be found here. We live in a transitional culture. Changes to jobs, schools, and houses are regular events affecting our relationships, communities, and churches. Many people move for work or other opportunities, and in our churches, change is a constant. As Christians, how do we find what it takes to serve faithfully in our ever-changing church community? Where do we go to be encouraged and equipped to thrive for the long-term as active members of local churches? 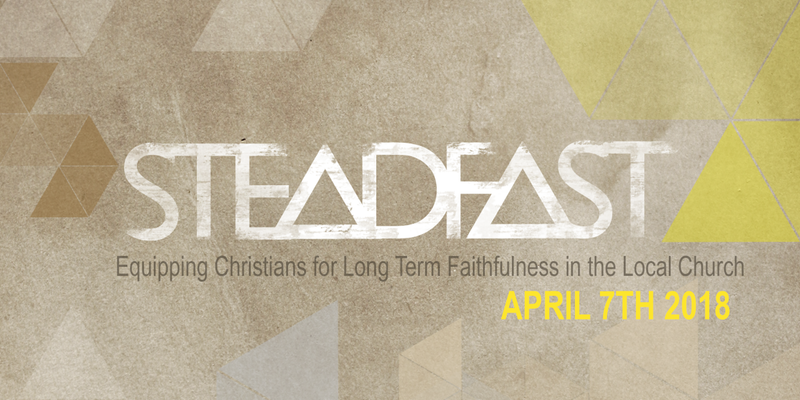 Join us at Foundation Church in Everett for a half-day conference, called Steadfast, to be encouraged and equipped for healthy, joyful service in your local church. Dave Harvey, Executive Director of Sojourn Network, will be the main session speaker. There is a $10 fee for the conference, which will include light refreshments and a copy of Dave Harvey's book, Rescuing Ambition. For more information on the conference, or to register for the event, click here. This week's featured resource comes from The Gospel Coalition. As we approach the beginning of Holy Week, we invite you to learn more about Palm Sunday from New Testament Professor Doug Moo and Andreas Köstenberger.